Wo hooo….remember in the Harry Potter movie (could not recalled which episode) where Harry tried to use the magic map which plotted every moment in the castle and when he walked through the library, suddenly he saw Professor Snape’s movement and quickly pull out his invisible cloak and put it around him. I think Professor Snape almost caught him. 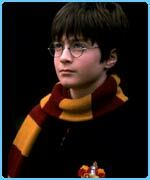 He used it again when he sneaked out to the nearby village with Ron and Hermione. They had drinks at one of the cafe. Harry used the cloak to teased Malfoy and his friends by hitting their back without them able to see him. The BBC news also reported the same thing. A Japanese clever-clogs has brought the magical world of Hogwarts one step closer! 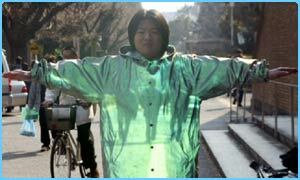 Professor Susumu Tachi of Tokyo University has made a coat that you can see through just like Harry Potter’s invisibility cloak. The picture on the coat is made by a viewfinder which puts together the moving images which are behind the wearer. Harry Potter’s not the only one with an invisibility cloak! The Japanese scientist hopes one day he’ll be able to make you completely see-through. This should help people like surgeons who would like to be able to see through their hands when they are operating. But we reckon it would be best for sneaking round school corridors when you’re meant to be in your house dorm!